"Instant Chai tea mix. You can spice it up even further by adding 1 teaspoon nutmeg and allspice, and 1/4 teaspoon white pepper." You may choose to omit the French vanilla creamer, and use 2 teaspoons vanilla extract instead. To do so, mix the vanilla into the sugar, let it dry, then break the sugar into small lumps. Follow the same procedure as above. Eh. 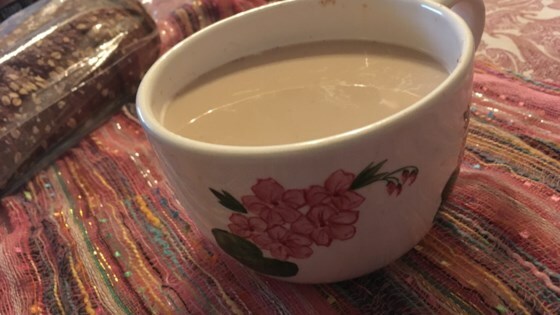 It was okay, it's just easier and much less time-consuming to make it traditionally by adding boiled milk to the sweetend tea mix.